This article is about the current Major League Baseball club. For the former NHL ice hockey club, see Colorado Rockies (NHL). For the mountains, see Southern Rocky Mountains. For other uses, see Colorado Rockies (disambiguation). In 1993, they started play in the West division of the National League. The Rockies were MLB's first team based in the Mountain Time Zone. They have reached the Major League Baseball postseason five times, each time as the National League wild card team. Twice (1995 and 2009) they were eliminated in the first round of the playoffs. In 2007, the Rockies advanced to the World Series, only to be swept by the Boston Red Sox. Like their expansion brethren, the Miami Marlins, they have never won a division title since their establishment; they are also one of two current MLB teams that have never won their division. As of 2013, all games are produced and televised by AT&T SportsNet Rocky Mountain. All 150 games produced by AT&T SportsNet Rocky Mountain are broadcast in HD. Jeff Huson, Drew Goodman and Ryan Spilborghs form the TV broadcast team with Jenny Cavnar, Jason Hirsh and Cory Sullivan handling the pre-game and post-game shows. The Rockies led MLB attendance records for the first seven years of their existence. The inaugural season is currently the MLB all-time record for home attendance. ^ Harding, Thomas (January 30, 2017). 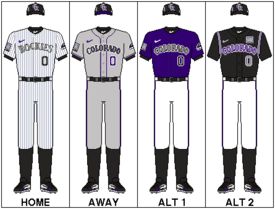 "Rockies outfitted with one shade of purple". Rockies.com. MLB Advanced Media. Retrieved January 31, 2017. ^ "Rockies Introduce Purple Mondays Campaign During 'Year of the Fan'". Rockies.com (Press release). MLB Advanced Media. April 6, 2012. Retrieved August 22, 2016. ^ "Rockies introduce 'Purple Monday' campaign". KKTV. April 6, 2012. Retrieved August 22, 2016. ^ "Batting Average Year-by-Year Leaders / Batting Champions on Baseball Almanac". www.baseball-almanac.com. Retrieved October 26, 2017. ^ Harding, Thomas (February 6, 2014). "Helton calls No. 17 jersey retirement 'very special'". Rockies.com. MLB Advanced Media. Retrieved May 7, 2015. ^ Harding, Thomas (September 28, 2010). "Rox unveil McGregor memorial at Coors Field". Rockies.com. MLB Advanced Media. Retrieved June 28, 2016. Wikimedia Commons has media related to Colorado Rockies. This page was last edited on 14 April 2019, at 23:15 (UTC).